This Chicago Gaming Pinnacle Foosball Coffee Table is much more than a stylish piece of furniture for your living room! 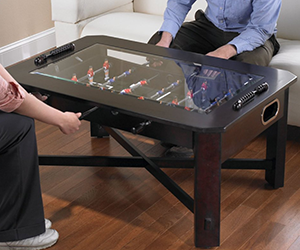 Invite friends over and start a dynamic and intense game of foosball on this cocktail table, or have a drink and a conversation with them! The table’s playfield has inlaid wood veneers, solid hardwood handles, stainless steel ball return, nicely hand painted footballers and beautiful wood carved details.